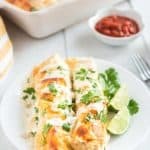 These rich and creamy White Chicken Enchiladas are an easy shredded chicken enchiladas recipe, covered in a simple sour cream and green chile sauce. They are easier than you think, making them a perfect weeknight meal! Spray a 9 by 13 baking pan with nonstick spray. Mix together chicken and one half of cheese. Fill tortillas with chicken and cheese mixture and roll. Place in dish seam-down. In a small saucepan heat butter until melted. Add broth and whisk again until smooth. Allow sauce to thicken and remove from heat. Stir in sour cream and chiles. Pour mixture over the enchiladas and top with remaining cheese. Broil an additional 5 minutes to brown the cheese.